In Croatia I puchased a package directly from the company’s shop only to later learn that the package had expired or wasn’t set up correctly and could not be corrected — and find myself with no service. When I ran out of data in Italy with TIM, I was left high and dry. TIM did permit me pay again until my 30 days were over! I spent a good deal of time in one of their stores waiting to find out what was going on and trying to add data or renew ahead of time. All in vain. I never want that to happen again, and I don’t wish it on anyone who truly needs internet while traveling. Choosing to skip the mobile services vending machine at London’s Heathrow Airport in favor of live advice, I headed out to find a cell phone store where I’d be staying. Except that I was later told there was no such person and shop in the tiny English town where I was staying. I knew I didn’t want a pay-as-you-go card. I’ve never liked running out mid-call or when I’m walking around town or working. Needing to run to a shop or be cut off has not been fun for me in Central America or Eastern Europe. I knew I wanted a set allotment of text, talk, and data for a set price. Even after eliminating the ones that seemed to be only pay-as-you-go, EVERY Pre-Paid package failed to tell the full story. One package offered 2gb of data, another offered 3gb. I wanted much more. No package implied there were other data options. The implication was that this package is for a 2gb plan and this other is for a 3gb plan. Full stop. The end. No package stated the time period. The word “monthly” was simply not there on any package. Was I to expect that the data was good until used up — because absent any other words, I did! Believe me, I sought time period info. Every traveler who needs service should. So should every other consumer. After 3gb was used up would I be permitted to immediately buy another 3gb? As I debated, my host commented that his adult son and daughter love giffgaff and are trying to get him to switch. I had my decision! I’d take that 3gb for £10 giffgaff package. I’d still have to worry about hitting the 3gb, but I needed something right now. 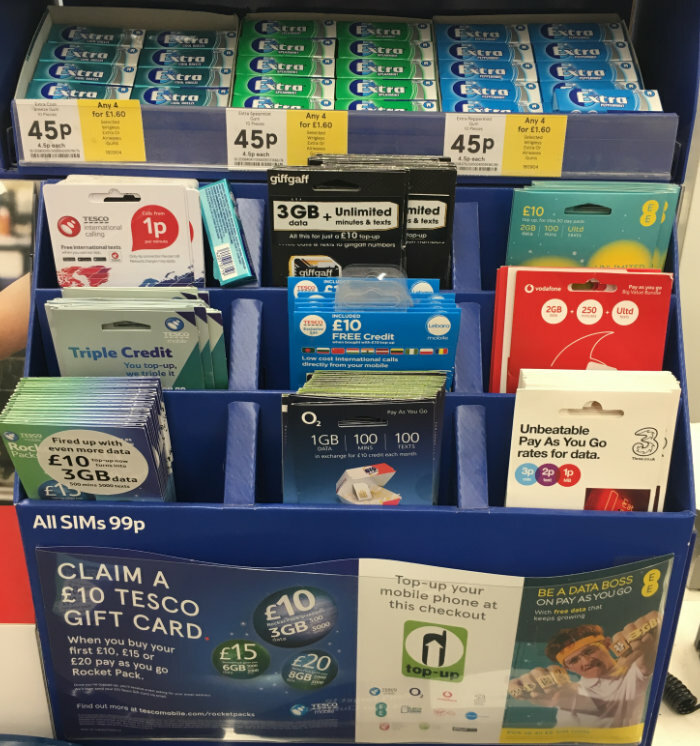 I brought my little giffgaff packet to the cashier and expected to be charged £10 + £0.99p for the SIM card as noted on this particular display. Nope. I was charged only the 99p. The fact that the package said 3gb for £10 did not mean that it was a 3gb package! To my dismay, I wasn’t able to pay for the actual data and minutes in the store. The cashier didn’t know how this worked. (The sign said “Top off your mobile phone at this checkout” and yet, no. At least, not for a new SIM.) Customer Services could help me, the young man said. The young woman at Customer Services knew absolutely nothing. I returned to my UK abode and went to giffgaff.com. So…having spent way too much time on this whole thing, I’m sharing some info about this mobile service I believe will be great for travelers. You can choose pay-as-you-go or choose one of several pre-pay plans. As I said, this is good. Here’s what happens after you have the giffgaff SIM card. Step 1: Enter the very short and thus clear SIM card number. Fortunately, you are taken to this page which actually states a time period: “Choose your monthly deal.” But why didn’t the package say this?!? Upon selection and purchase of a monthly plan, you will see your renewal date. As I paid I was worried they might not accept my credit card. Happily, they have a pop-up that lists the various counties of addresses so I was able to guess they would accept me, and they did. This means that even when I leave the UK for the Continent, I can continue to have this phone number and plan by renewing online. I’m not sure yet what the deal is outside of the UK. I’ll need to update you on that later. Step 5: Wait for activation. In my case, I hadn’t had the SIM in the phone when I activated it so it took hours and a shutdown and restart. Thus, my suggestion of step 2. Wondering if your giffgaff SIM and service will cover you when you leave the UK for Europe? Have a look at this page to learn about roaming. UPDATE November 2018: I am happy to report that this service worked quite well in Northern Ireland and then when I left the UK for Ireland and Austria. The website clearly states the roaming situation and that we’re covered in the EU. Free giffgaff SIM sent right to your home! It turns out that I didn’t really even have to spend .99p on this SIM-only package after all! I could have gone online and they’d have mailed one to me in just a day or two. In fact, had I known about giffgaff before I came to the UK, I could have ordered a FREE SIM card to be mailed to my home and arrived to the UK with full service! I’m telling you this so you don’t go through all the wasted time that I did. Check the site to see if this will work for your home country or for the country you are travelling from. Here’s a link you can use. Technically it gives me a credit, but as I won’t be using my SIM for very long, it’s not really a profit center. It’ll just maybe help you get started. For the future, it should be stated up front (by them, not me) that your pre-pay plans are monthly and renew every month. TELL US that this is not Xgb that last an unlimited length of time until they are used up! Front of giffgaff SIM package with my edits. 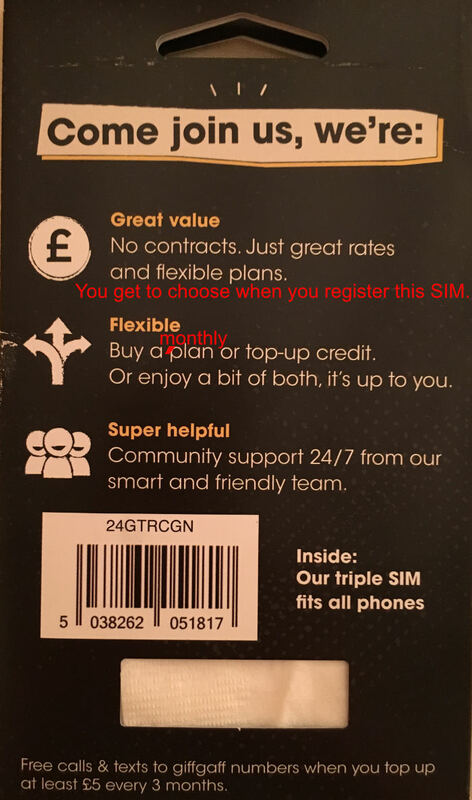 Back of giffgaff SIM package sold in stores with my edits. I think it would be so nice if the packages gave us this sort of information. Give consumers a break. Don’t keep us guessing. Don’t make us painfully twist our minds trying to guess what you are not saying. When I see 8gb data for £15 (the plan I selected and purchased), I expect that upon using the 8gb data up, I can purchase a new plan and have more data. I expect that I don’t need to purchase more until I am close to using up the 8gb. I do not expect that at the end of the month, the data/minutes/texts expire. When I see the word “monthly,” then I expect the data/minutes/texts to expire at the end of the month. Month means from the 2nd to the 1st, the 15th to the 14th. This 30-day thing I am seeing in some places (AT&T USA, my USA service, included) isn’t cool. Please know that this isn’t a service review. There may be other great or equal or better services in the UK. This is simply the one I am using. I like that it was relatively easy to start with and that they send us a free SIM so we can be ready to travel. UPDATE November 2018: I much prefer to be able to phone a customer service person than to have to do several emails, but I’m still happy with the help I have received when I have had questions. The cellular service has excellent for me; I’ve always been connected to a good quality roaming partner (no extra cost) when out of the native area. After having this service for four full months I now feel I can recommend it. Does it pay to get local service as you travel? You’ll have to think about what’s right for you. Some short-term travelers from the United States are fine paying US $10 per day for their American plan’s International phone service. They say it’s a convenience for not having to bother with a new cellular plan. 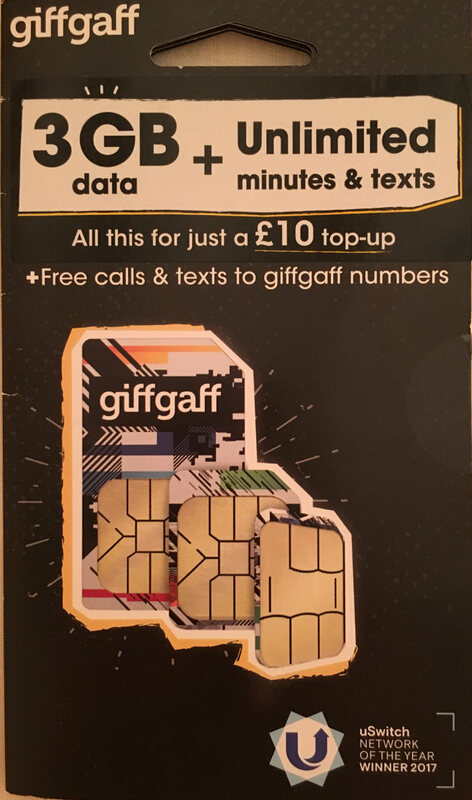 However, if you have an unlocked phone, for less than 2 days at $10, you can have giffgaff service in the UK: a local phone number with unlimited calls and texts as well as 8gb of data. Years ago I loaned a SIM card to a young woman who was going to Costa Rica. I’d had lots of time, minutes, and data on my SIM so I insisted she take it with her. She returned with stories of her “Butterfly Effect.” She was able to have great adventures there becuase she had phone service. She was able to meet up with multiple CouchSurfing members who took her places she’d not have gotten to on her own. You might travel well without phone service, but having it can greatly expand your experiences. Do you have UK mobile phone advice to share? If you can share cell phone (mobile) advice with fellow travelers based on your own recent experience, I’d welcome it. If so, please leave a comment and I’ll approve it. And, as always, ALL comments are welcome. Please let me know if this helps you in any way, how you like the info here, or anything else at all related!